A CT scan is an imaging procedure that utilizes X-rays in order to provide pictures of the internal structures of the human body. This is a painless procedure. The images produced are cross-sectional in nature. Each 2-D imaging slice resembles what you would see if for example you took an apple and sliced it in half across the middle and then looked at the cut surface. If you did this starting at the top of the apple and worked down to the bottom you would have a series of slices that represent the entire structure. With the aid of a computer, 3-D images can be reconstructed from these 2-D slices. 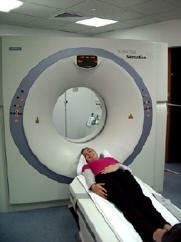 A neurologist will usually request a CT of the brain or spinal cord. At times, a CT of the sinuses or chest may also be requested. CT scans aid in the diagnosis of many conditions including: herniated discs; mass lesions such as tumors; infections of the brain, meninges or spinal cord; stroke and intra-cerebral hemorrhage as well as several other conditions. Modern CT scanners can produce the required images within a few minutes. If intravenous contrast is to be injected, this will require additional time in the order of a few minutes as well. The entire length of the study should not exceed 15 – 20 minutes. It is best to wear loose, comfortable clothes. It is advisable not to have any metallic items since these may cause interference and thus degrade the quality of the images. It is recommended not to ingest any food or liquids for 4 hours prior to the procedure in case contrast material needs to be injected. You will be asked to lie on a firm, movable table. The part of the human body that is to be scanned is then positioned into the doughnut-shaped machine by sliding the movable table. You will be asked to remain still since any movement can degrade the quality of the images. The CT technician may instruct you to hold in your breath so as to improve the image quality. 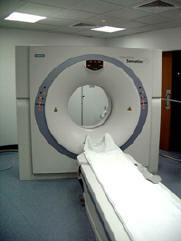 Through a window, the CT technician is able to continuously observe you throughout the length of the procedure. A two-way intercom system facilitates communication between you and the technician. Once the examination is completed you can immediately return to your usual activities. Occasionally the CT radiologist may decide to administer an intravenous contrast agent (dye) in order to further clarify what is seen on the images. The CT technician will then insert an intravenous cannula through which the dye will be injected. When the dye is injected you may feel a warm sensation and experience a metallic taste in your mouth. CT scanning is a minimal-risk procedure. The amount of X-ray radiation that you are exposed to is minimal and well within the safe range. If contrast material is to be administered you will be asked several questions in order to ensure that you will not be harmed by the dye. You must report any allergies, especially to shellfish or to iodine-containing compounds (most contrast agents are iodine-based). Most people do not have an allergy to contrast material and it is likely that you will tolerate the dye without any difficulties. Some people, however, develop an allergic reaction which may include itching, nausea, vomiting, a rash and respiratory difficulties. Immediately notify your CT technologist should you experience any of these symptoms. In rare cases an anaphylactic reaction may occur. This is a severe reaction and requires immediate medical attention. Patients who are dehydrated or suffer from diabetes mellitus are at an increased risk for kidney damage. Likewise patients with underlying kidney disease risk further damage to their kidneys. If you have any of these conditions you need to inform your physician. If you are pregnant or suspect that you may be pregnant, you must inform your physician, the radiologist and/or the CT technician. X-rays may cause harm to the fetus especially during the first three months of the pregnancy. Sometimes a shielding device may be used in order to minimize the amount of exposure if the CT has to be performed despite your being pregnant.